Indulge with this smooth and creamy one-pan Mint Chocolate Lasagna. It's the perfect no bake dessert to bring to a potluck or holiday gathering! Beat together cream cheese, powdered sugar and peppermint until creamy. Fold in 1 cup of the whipped topping. Add green food dye until desired color is achieved. Spread over Oreo crust. 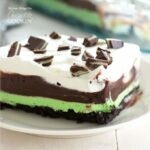 This recipe for Mint Chocolate Lasagna was printed from AmandasCookin.com - https://amandascookin.com/mint-chocolate-lasagna/ and can only be printed for education or personal use.